No stashing today, but I do have a finished knit to show you - trust me, a really simple knit. I know I say that every the time I post a knit project, but this one truly is easy peasy. 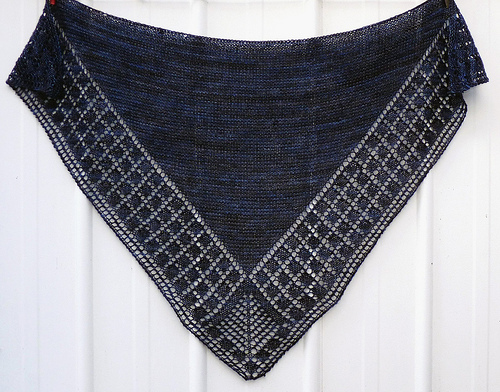 If you haven't used a chart before to knit a lace project, then Alivia is the one to start with. Although this project requires row counting, the main chart repeat consists of only 12 rows, 6 of those being a combination of purl/knit rows. 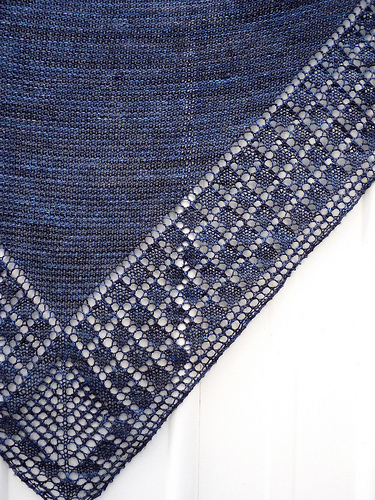 Although it isn't my most "impressive" knit of late, I really do love the geometric design of this project. The no frills, straight lines and repeating squares appeal to my traditional eye for pattern/shape. I can see another Alivia in my future already. It looks so soft and lovely! I do so wish I could get the hang of knitting. I really have tried several times, but the fight that ensues between me and the needles.. it just isn't pretty. Someone could loose an eye!! I will just admire your beautiful work. I don't knit, so it looks Very impressive to me! I think it's beautiful. It makes me want to learn how to knit. Wow....that shawl is gorgeous.....and although you said it was easy-peasy.....it looks highly complicated, and exquisite! Beautiful work! Lovely, Rita. You have beautiful tension. beautiful! I love the lace design, not too frilly and VERY stylish. I think I just might make it for my MIL for christmas, if I can find the time! Another beautiful Shawl Rita - they are a bit like quilts in that you simply can't have too many. 'Tis a thing of beauty! (I think I say that every time you post). Thunderstorm has to be my all-time, fave Tosh colourway. love your shawls, rita! this one is gorgeous. Lovely, just ordered the pattern. Pretty! I am happy you're a knitter too, I was just following for quilts but I knit too! Well done, it is gorgeous. You may not find this to be impressive but I am blown away. It's so delicate looking and perfect. Just beautiful. I really love this. I agree, the geometric pattern is refreshing. You are making me want to pick up the sticks and get knitting again. The colors are perfect. I haven't knitted in such a long time. When I see a great pattern such as this it might just be time to pull out those needles! 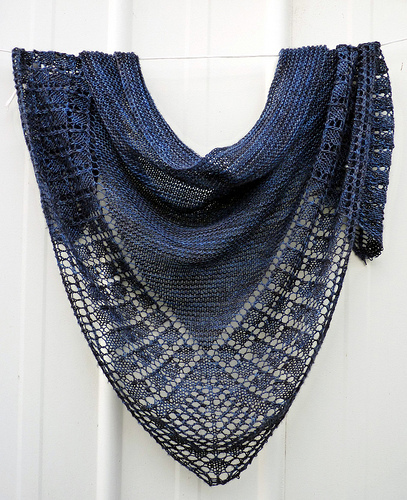 I attempted knitting once -- I'd love to get back into it -- your creations are so inspiring and I absolutely LOVE this latest shawl! I love the delicate yet modern look -- beautiful job! It looks impressive to me. Lovely, great colour, too.